Stacy Tilton Reviews: Celebrate National Ice Cream Month with Unilever Ice Cream! Celebrate National Ice Cream Month with Unilever Ice Cream! It’s time to celebrate National Ice Cream Month (and National Ice Cream Day THIS SUNDAY, July 17!) with Unilever Ice Cream! 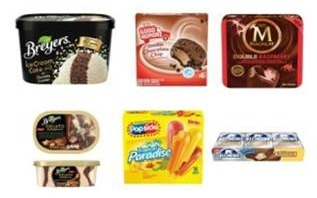 Unilever Ice Cream – which includes Breyers, Good Humor, Klondike, MAGNUM Ice Cream and Popsicle – offers a wide range of products and flavors that range from refreshing to indulgent; in fact, in 2016 alone we launched 17 new varieties across the portfolio! Unilever Ice Cream has something to satisfy every craving. Some of the new varieties in 2016 include Good Humor Double Chocolate Chip Cookie Sandwich, Klondike S’mores, Breyers Ice Cream Cake, and Breyers Gelato Indulgences Peanut Butter Chocolate. Popsicle’s Tropical Paradise variety takes you right to the beach chair, at only 70 calories a pop! Enjoy the refreshing flavors of Tropical Mango, Tangy Pineapple, Fruity Island Punch and Sweet Strawberry-Banana. Additionally, MAGNUM’s Double Raspberry variety offers pure indulgence with rich Belgian chocolate and silky raspberry ice cream. Popsicle’s Sugar Free Red Classics offer the great classic tastes of Cherry, Strawberry and Raspberry without the sugar. And for a frozen treat on the go, Breyers Chocolate Snack Cups and Natural Vanilla Snack Cups come in pre-portioned snack cups. Natural Vanilla (America’s favorite Vanilla! ), French Vanilla, Extra Creamy Vanilla, Homemade Vanilla, ½ the Fat, Sugar Free, Lactose Free and more. We love the Klondike and Magnum ice cream bars! Oh those all look so good! Our little one loves popsicles! I have to try that MAGNUM’s Double Raspberry! Oh that would be so good!